I hope you’ve all been having a wonderful weekend. I don’t know where the time goes but here we are at another blog post a whole week later. I really do want to blog but I am just so swamped with work and then lack energy to catch up. So bear with me while I get myself organized! Anyway, I went to the library this weekend to pick up one of my holds and as usual I love to see what’s on the new books shelves and found some books I had not heard of that I wanted to check out. So let me tell you a bit about them. The one book I had on hold and not pictured here is Something New: Tales from a Makeshift Bride by Lucy Knisely. I love her books and this might be the only one I haven’t read yet. I’ve already started it and it reminds me a bit of French Milk with the use of photographs to supplement her drawings. Next up is Secrets of Paper and Ink by Lindsay Harrel. A woman who finds a journal in a notebook which will help her find herself and learn about the woman from a century ago. Journals and bookstores? Oh yes, I need to read this. Useful Phrases for Immigrants by May-Lee Chai. As you know, I enjoy to read books about the immigrant experience and this is a book of short stories. I don’t read too many of them so I thought it was time to check some out. Alone Time by Stephanie Rosenbloom. This is a wise, passionate account of the pleasures of traveling solo. I have done some traveling on my own and of course much prefer to be with my husband, or when I was single, going with my friends, but I do believe everyone should try a trip on their own at least once. It’s a great way to feel like you can do anything! Monument by Natasha Tretheway. This is a poetry collection from the two-term US poet laureate and Pulitzer Prize winner. I have not read any of her poems so I was happy to find this book on the new books shelves. 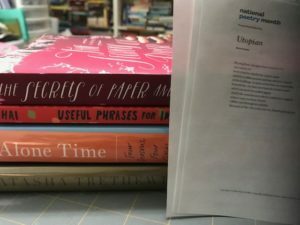 Finally, I was so excited to see a display of books for National Poetry Month and they even had poems printed out for patrons to take away for Poem In Your Pocket Day. I had to grab several and look forward to reading them and maybe adding them to my own poetry collection. So there you have it. What about you, have you made any trips to the library recently and what did you find? I feel you, Iliana. I feel much like that too. Swamped with work and not a lot of energy for other things. I am glad you made it to the library! We went this past Friday to request a few nonfiction books about sea turtles for my daughter’s latest school project. Hopefully they will come in within the week. Your library books sound interesting. Secrets of Paper and Ink in particular! I hope you have a great week! Secrets of Paper and Ink sounds really good. Happy Reading! I’ve been spending quite a bit of time at the library. 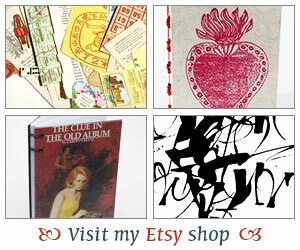 Any time one of my holds comes in, I wind up wandering around the stacks, as well as checking out the new arrivals. I’m not making any progress on my own stacks, but I’m having fun borrowing books that are on my TBR list. We are on another road trip, so I’m hoping to get in a lot of reading time. As far as traveling alone, I don’t think I’ve ever done that, but I have gone on trips with my daughter when she was pretty young. Not been to the library lately, but it is probably time for a visit. 🙂 Glad you were able to pick up your holds! I always can’t resist going to the New Arrivals section. Who knows if you might find the books you want so badly, right? I hope you enjoy the books and I’m looking forward to hearing your thoughts on them, Iliana.